I had to blink once or twice when I saw this photo in Saturday’s paper. I mean, that 65 pound monster was grown here in Bozeman. By a third grader. I bet it outweighs her. You can read the article in the Bozeman Chronicle, or join me in my room, where you’ll find me sobbing under my bed. The aptly named Meadow grew not only the largest cabbage in this year’s Bonnie Plants Cabbage Program, but the largest ever grown in the program. Clearly, Meadow has a great future as a gardener. Me, I’m going to retire. 8 Responses to Coleslaw, anyone? Oh, my gosh!! That’s a cabbage or two or three…. There’s a reason why most actors hate to work with kids. Anyway there’s a lot more to gardening than a huge cabbage. Bigger is not necessarily better. 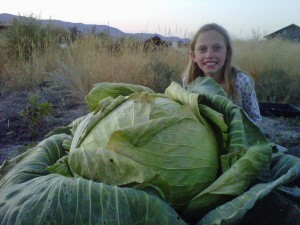 Meadow probably won’t be smiling so broadly if she has to eat all that cabbage. I never understood why people grow such large portions of food. I think food should be taken seriously and not treated like a class project. I just can’t see these portions being consumed without being wasted. Of all the things to worry about in this world (and there are plenty), you’re concerned about a child growing a big cabbage? You’re right that bigger is not better, but if growing a big cabbage gets kids interested in gardening, that’s an incredible idea, in my opinion (would be really cool if they were taught to do it organically, though). That is the biggest cabbage that I’ve ever seen! I don’t even think I’ve seen a pumpkin that big (in person). Fear not Kate – If you grow something that huge at such a young age, what else is there to aspire to?! 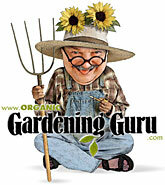 I hope I never succeed in such a feat as the continual attempt at successful gardening is the thing that keeps me going! (sorry I haven’t ‘visited’ for a while – hope all is well in your garden). W.
It looked like the cabbage is more likely to eat Meadow rather than her eating it. Bozeman surely created a great event to urge kids to do gardening. They also get a scholarship for winning the contest to boot. As for me, I’m not growing any over-sized cabbages in my garden but i’m proud to say that we can have a healthy salad regularly because of it. 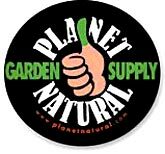 Found this website http://danthegardener.com/ and got really cool gardening tips from it! I find that one of the things I really enjoy about gardening is sharing my harvest with others. My hydroponic systems allow me to grow and harvest more than we really need, but there’s always someone we can find to take some off of our hands!